I'm Karis, your resident boutique geek. I created this blog to showcase my own personal fashion while celebrating the inspiring people behind my favorite independent fashion businesses. Apr 10 Meet Horizons Vintage! I know I've been gone for a while, but life has been really crazy lately! Two weeks ago I went to New York for my spring break and it was wonderful (I didn't take many photos or anything, but I might still make a post about my experience). I wanted to do at least one boutique feature when I was in town, and Horizons Vintage immediately came to mind. My boss and I had wandered into the store last September when we were in town for market week and struck up a conversation with the owner, Breanne. When I reached out before my trip, Breanne actually remembered us! The store features a wonderfully curated collection of vintage pieces that are very modern and chic. Located in Williamsburg, it's surrounded by many other very cool small stores and restaurants. Horizons has undergone some exciting changes lately with Breanne bringing in new independent designers to feature alongside her vintage selection. Plus, she opened a new location in Orlando, Florida last fall! Unfortunately, Breanne was at the Florida location when I was in town, but I emailed her to learn more about the store after I stopped by to take photos. A true vintage veteran (she's been selling vintage pieces since 2002! ), she shared her vintage-finding secrets as well as her experience as a business owner. A table of gorgeous silver jewelry pieces. When did you open Horizons and what made you decide to take the plunge and open your own store? "Horizons opened in October of 2007. I'd been selling vintage online and at markets for five years by then. When I saw my first space (right next door to my current shop) I became pretty obsessed with finding a way to make it happen. I couldn't believe that the brokers actually took me seriously as I had no money in the bank and almost no credit history but once I started saving up it seemed like there was no going back. I believed that other people might come and take it from me or that I was competing with someone else who was trying to raise the money as well. This was probably all in my head but it pushed me." Racks on racks! Vintage clothes are mixed in with new designs and are organized by color and style. While you have many unique pieces in the store, I definitely feel a unifying style that brings it all together. Could you describe the style or aesthetic of the pieces you carry? "The aesthetic is from my own memories and TV and Movies. Its just about everyday dressing from as early as the 60's, but I favor the late seventies through the early 80's. Whatever ends up being revived from the years since then, you will always be able to find clothes from that era in my shop so long as I'm able to find them. I try to find pieces made with natural fabrics and subtle details." How do you find all this great vintage? "I probably shouldn't say this but I really do find most of my merchandise at thrift shops. I've never found a better source and I hate shopping where things are presorted. You can go to different parts of the county and the thrifting is different and that keeps it exciting for me." 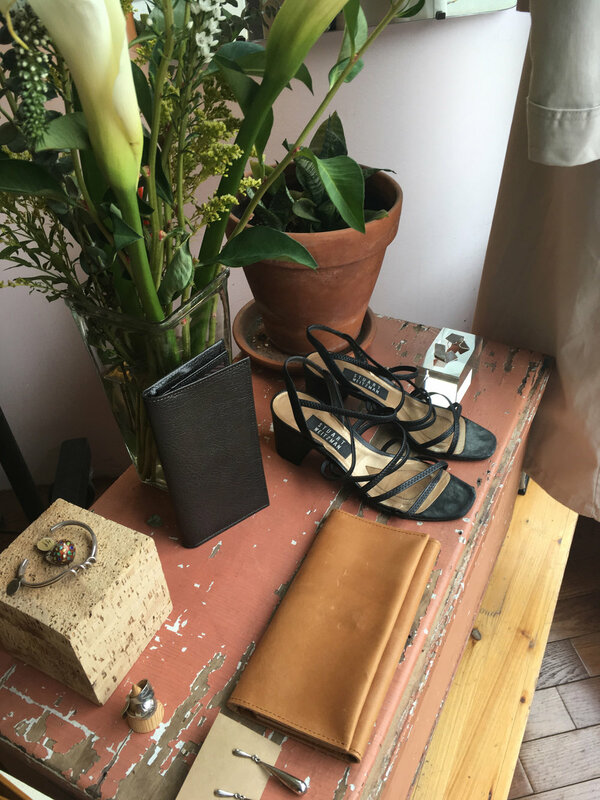 Breanne also carries a few home and body items alongside her amazing collection of jewelry. Aside from the vintage, I know that you now carry some new clothes from small brands. How do you find new brands to bring into the shop? "So as far as the new brands, I started doing pop ups with friends who make things and saw that my customer also likes new, unique clothing. 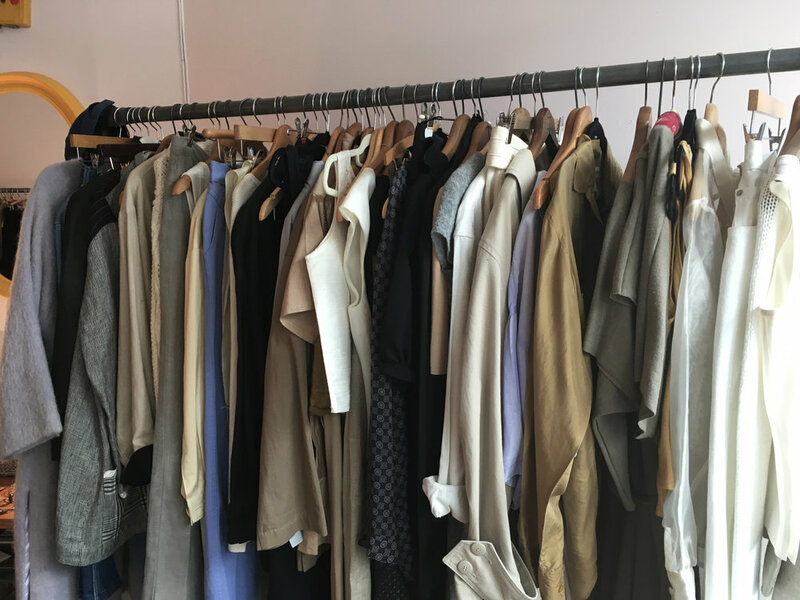 Through friends and finding brands on Instagram I integrated new clothes into the store, and last fall I went to my first trade show and found brands that way." What's your coolest vintage find to date (or your top favorites if you can't pick one)? "I always think of a few Romeo Gigli pieces I found years ago. One was a grey dress with three or four knots down the side of it and another was a deconstructed menswear shirt with cut out shoulders and a big panel that went all around the bust to the back. So cool. I also have a Galanos white dress that I won at an auction. Its wool with romantic sleeves and a scoop neck. The A-line skirt goes a little past my knees and it's off white with a bright white leather belt. I don't want to be married but I hang onto it for good luck anyway." Some accessories and plants brighten the window display. What's it like managing two different stores? Do you find yourself having to cater to different styles in your Orlando location compared to the Brooklyn location? "I haven't figured out my customer in Orlando yet, or my customer possibly hasn't found me. There aren't a ton of people walking around outside so I have to find a way to bring them in. People drive everywhere like in LA and I'm in a tricky location with very little parking. I feel a little strained with the two stores but in many ways it's exactly the same. I already found great people to help me out. Part of bringing in the new brands was to help fill the stores without having to constantly thrift, but It hasn't kicked in yet. Hopefully I'll find a balance of brands that people love but still provide the vintage i'm known for." Details of a lovely collar & some unique yellow pants. Finally, what are the most difficult and the most rewarding aspects to being a business owner? "The most difficult thing is having so sense of security about tomorrow. I have to try and predict what people want and take the right risks. The most rewarding this is that I don't have a real job! Now I have to make this work because I don't know how to work in the real world!" But wait, there's more! A rack of eye catching pieces sits outside to draw customers in. Thanks so much to Breanne for letting me stop by and for answering my questions! If you're in Brooklyn or Orlando, definitely stop by the shop to take a look! The Brooklyn store is located at 381 Metropolitan Ave, and the Orlando store is located at 1817 N Orange Ave. If you're not in these areas, fear not! Breanne lists many of her pieces online and on Instagram. The product photography on the website reflects the local style and scenery in Brooklyn and Orlando. 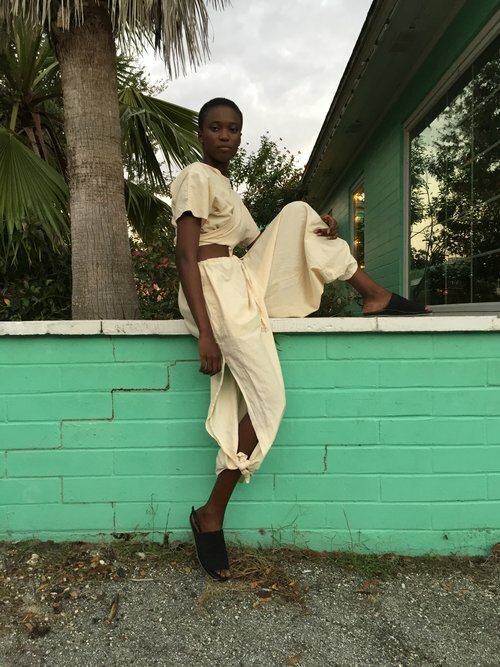 Pictured here are the Wide Pants by Revisited and the Cotton Genie Set by Tiger Rags. Get updates on the coolest stores and brands to watch.